It seems likely that India is now polio-free, a first for a nation that has been one of the last strongholds for the tenacious poliovirus, a new report says. The report points to the fact that there have been no cases of polio reported in the past few months, a period which is typically high season for polio transmission in India. The report on the status of India's polio fight is in this week's issue of the journal Morbidity and Mortality Weekly Report, which is published by the U.S. Centers for Disease Control. The last reported case of polio in India was recorded in mid-January, a more than nine-month polio-free stretch that the report calls "unprecedented." In 2010, there were 40 cases of polio in India from January to the end of October. If polio transmission is stopped in India it will be a huge success for the country and for the global polio eradication effort. For years the virus's hold on India was so strong that some experts worried spread of polio there could not be stopped with the currently available medical tools. 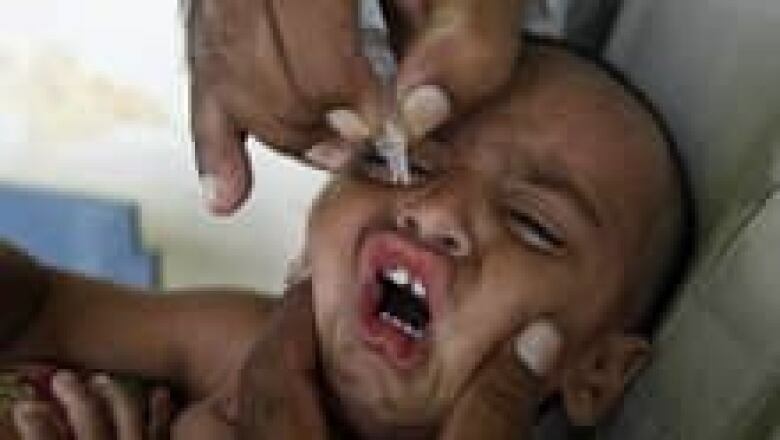 "Elimination of WPV [wild poliovirus] in India will establish that WPV transmission can be interrupted even in the most challenging of settings," editors of the journal say in a comment that followed the report, which was submitted by experts from India's Ministry of Health and Family Welfare, the World Health Organization and the CDC. The report notes that in addition to the lack of new cases, a program that looks for polioviruses in sewage in three key areas of the country isn't spotting viruses either. The sewage surveillance is considered an early warning system. When polioviruses are found to be circulating in sewage, cases of paralytic polio often follow. Viruses were last seen in the sewers of New Delhi in August 2010 and in the sewers of Mumbai in November of last year. "If no WPV is identified throughout the high-transmission season in 2012, India will be regarded as polio-free," the journal editors say. They warn, however, that India is at risk of having its progress undermined by the importation of viruses from elsewhere, including neighbouring Pakistan. Polio efforts in Pakistan are flagging. The country has recorded 136 cases of paralytic polio to date this year, compared to 101 for the same period last year. Earlier this fall China reported that viruses from Pakistan had triggered China's first polio outbreak in over a decade. To date, China has reported 18 cases in that outbreak.